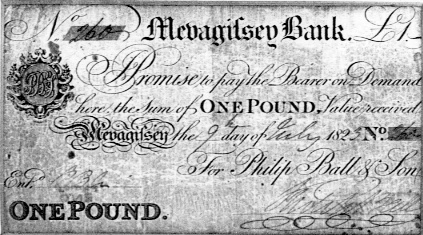 Philip Ball & Son founded a bank in Mevagissey in 1807, issuing its own bank notes, a copy of which can be seen in the museum along with the old bank door, which was saved after renovations in 1976. Tha bank went bankrupt in 1824 causing much hardship to the people of Mevagissey. The Ball familys debt to the village was more than repaid, however by Philip's son Timothy who became the local doctor and nursed Mevagissey through the cholera epidemic of 1849, when 115 people died in five weeks.